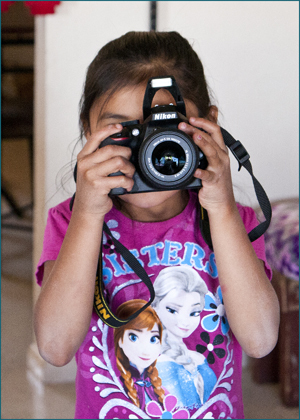 Heidi is a young mother living in Cibecue, Arizona. 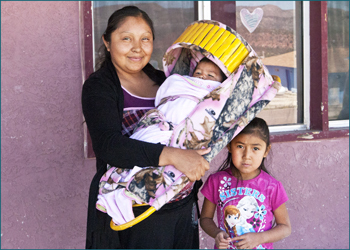 Heidi is a young mother living in Cibecue, Arizona, which is part of the White Mountain Apache Tribe. We were pleased to meet Heidi and talk with her about her new baby, Sabrina. 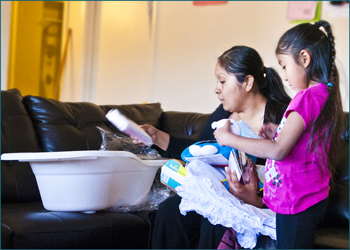 She shared about the celebrations and challenges of being a young mother, as well as the support she received from family, community, and the Southwest Reservation Aid™ (SWRA) Program's Cradle Club service. Ranelle was very welcoming when we came knocking. The day of our visit, we found Heidi in the living room with Sabrina. Ranelle, Heidi’s five-year-old, just arrived home from Head Start. 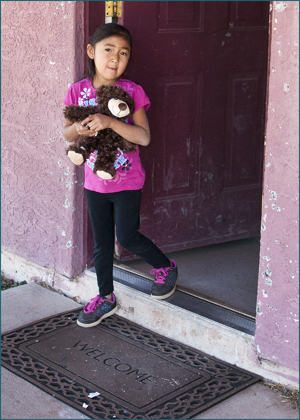 Heidi’s 9-year-old, Arianna, wouldn’t arrive until closer to dinner — she attends school in Whiteriver, which was about 50 miles away. Ranelle was very welcoming when we came knocking. She helped her mom with the baby and kept the visitors occupied with her musical talents on a small FrozenTM instrument. She was particularly interested in the camera, so we turned one over to her so she could take a few shots of her favorite areas of the house. Ranelle helps her mom with baby Sabrina. Ranelle was particularly interested in the camera, so we turned one over to her. Heidi went through the Good Start Basket that we had brought. She would have received it at the clinic when she took Sabrina in to complete her immunizations. It’s used as an incentive for moms to bring their babies in and to keep their babies current on all their required preventative shots. Heidi then brought out the cradleboard that was given to Sabrina. Made from wood, soft pink camouflage fabric covered the back and the front. She explained that the camouflage honored Sabrina’s father’s love of hunting. There isn’t much employment in the area, so he collects antlers and sells them to the many stands that are set up to purchase them from locals. We saw at least four of these makeshift businesses set up in parking lots throughout the reservation. Various trucks, trailers and vans were set up with signs to purchase antlers. Apparently, the antlers are used for various types of arts, jewelry and even light fixtures. Heidi went through the Good Start Basket that we had brought. Heidi shared that she nursed all her girls. Ranelle was breastfed the longest. During her seven month prenatal appointment with Sabrina, the physician asked her to stop nursing Ranelle. Because it could cause premature labor, she stopped. 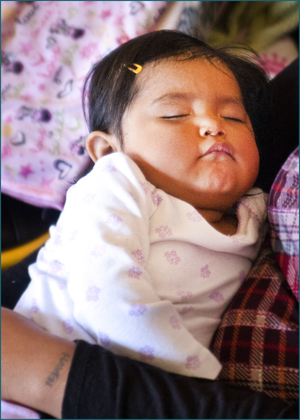 She nursed Arianna for eight months, but because Arianna had a stroke in utero, she suffered some paralysis on her left side and needed to have special formula to keep the appropriate nutrients in her system. Arianna has to travel the fifty mile distance to school in order to get the best education available to her. She is very happy at school, loves to read, and even takes over the class to read to her classmates! Ranelle is approaching her preschool graduation with Head Start in a month. She is excited about it. Heidi is offering her the choice of getting on the bus with Arianna and traveling to Whiteriver, or attending the elementary school in Cibecue. Ranelle wants to go to Cibecue because it’s closer, but Heidi had to warn her “don’t run home.” Apparently, Ranelle has walked to the school from her house before with a friend and the school yard isn’t fenced like her Head Start playground! Sabrina settles down well and took a nice nap after her feeding. Heidi seems pleased with Sabrina’s development, saying, “She is able to stand on her own for a good 10 seconds.” Sabrina appears very confident in what her abilities are for an eight month old. She is very curious and already prefers to do things on her own when she can. She settles down well, even with her sister creating noise around her, taking a nice nap after her feeding. At the end of the visit, Heidi was nice enough to invite us back so we could see her and the girls in their traditional regalia. She mentioned that they need to sew new dresses, though, because the children are all growing so quickly. We would love to visit this family again and celebrate their lives with them. All bets are that Sabrina will be cruising on two feet independently by the time we do! Thank you for making this service possible!